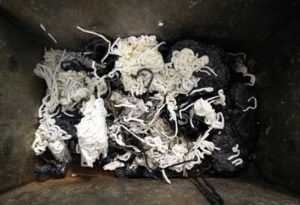 An Aquapurge client produces both black 50% Glass Fibre (GF) Polyamide 6 (PA6) technical material and medical parts in natural polypropylene (PP) on the same 200 tonne machine which must be manufactured to extremely high standards – only zero black specs is acceptable. Previous purging results suggested to our clients that this would not be a cost effective change. They argued that although black specs would not appear immediately after the purge, they would emerge an hour later and in waves every few hours. Wasted time. Wasted PP. Not a great outcome. This was a very tough change from PA6 to PP. PA6 is processed at a higher temperature than PP making removal of the PA6 difficult, and in addition PP being clear highlights black specs more easily, so you’d usually expect some kind of contamination. But they hadn’t reckoned with Barrel Blitz Universal (BBU). Once the purge was complete the natural PP job was run. 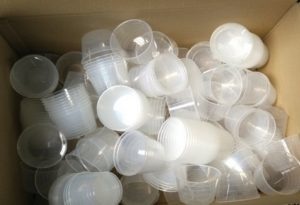 The very first cup produced was perfectly clear with zero black specs as the client required. These cups are a very familiar sight in hospitals, commonly used by medical staff to provide medicine and tablets for patients. OK, promising start but that was only the first part of the challenge. Our demanding clients wanted to be spec-free throughout the production. Etienne popped out and returned 2 hours later. Although there were moulding issues (which doesn’t relate to the purge) no more black specs were found. Zero. And look at how many they’d produced. He followed up one week later. Still no black specs. That’s what we’d call a result. Our customers had tried every product they could find and the best of them would take up to 2 hours to purge. But once the purging was complete you could churn out rejects with black specs for hours. It’s very likely you’d need to carry out a strip down to ensure all black specs were cleared and this could take about 4hrs. Compare and contrast. Aquapurge products do the job in a fraction of the time, and with the appropriately named Barrel Blitz Universal you’ll only need 1-hour of down time. Purge with lesser products and it could take up to 6 hours before you can make your next product. We guarantee every new product you manufacture will be pristine and completely spec/contamination free in similar scenarios. Sixty minutes and you’re straight back to business. Interestingly the client rep who Etienne worked with was initially very sceptical, and was sure BBU wouldn’t work, especially as they’d tried many alternatives. WOULD YOU LIKE TO TRY OUT BARREL BLITZ UNIVERSAL? If you’d like to find out how AquaPurge products, including Barrel Blitz Universal could assist your PP and PA6 manufacturing process please get in touch. 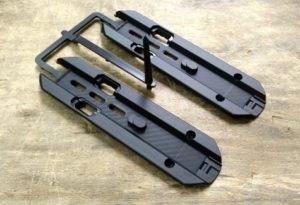 Barrel Blitz Universal can be used in any type of injection moulding machinery. 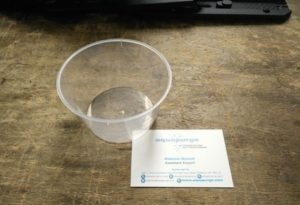 In this case study it was a 200T Billion machine and perfectly clear PP pots, but if you’re not sure about the benefits we’re only a phone or an email away. We’ve created a ‘flipbook’ for all of our case studies. Click here to view the ’50% GF PA6 to ClearPP’ flip book.